Pes is kickstarting his next stop action film, Submarine Sandwich, and the video itself is already mesmerizing! 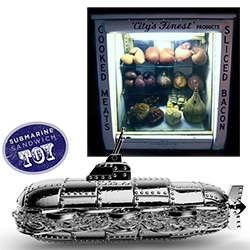 Additionally, he's even offering his first limited edition 5" sub TOY as one of the rewards. 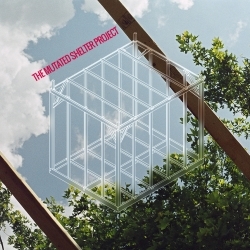 The Mutated Shelter Project, an interactive database archiving mutations of 8ft x 10ft x 10ft wooden stick frame structure. We are looking for submissions of iterations - new designs and warped versions - of a downloadable template. 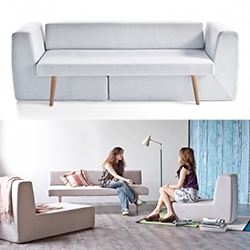 Sofista - modular sofa designed by Fabrizio Simonetti. A 3 seater sofa, armchair, chaise longue and single bed: all in one! 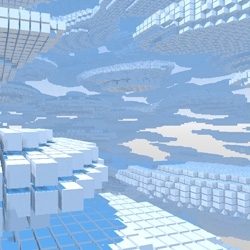 VIDEO'Clouds in Cloudless Skies' - code generated music video featured in The Creator's Project. Bladerunner meets Koyaanisqatsi meets Minecraft. An exploration of random infinite beauty through the art of computer programming. 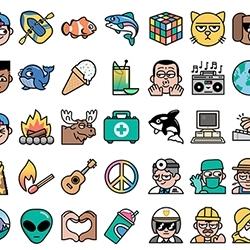 It's Nice That interviews Dan Woodger - who created 1000 brilliant emoji in over 1000 hours! 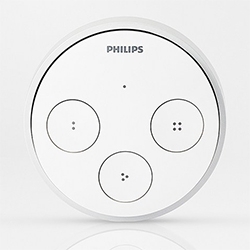 Philips Hue Tap - the wireless smart switch to control all of your Huge lights. Four buttons - for your favorite scene, light recipe, switch some lights off, etc. 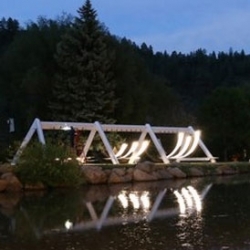 Runs on kinetic energy - so no batteries needed! 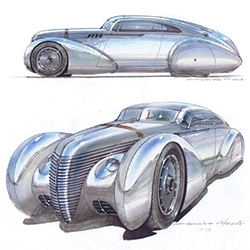 VIDEOJonathan Ward of ICON gave quite the talk at Nike - discussing everything from how he started, his design process, his vision, what Howard Hughes would take Cruella Deville out in, and a peek at his dream airplane inspired/Tesla powered Helios. Home is where the hammock is. 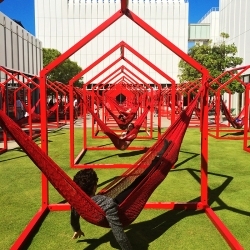 Woodruff Arts Center, in Atlanta, where 40 red metal frame houses outfitted with hammocks dot the interior piazza. By Esrawe. 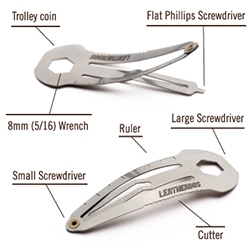 Leatherdos - stainless steel multi tool hair clip to arm your... 5 year old girls? 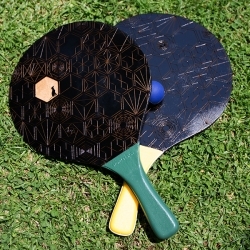 Designed by Yaacov Goldberg. The Haack Table by Sean Woolsey is made of American Black Walnut and an angled steel base is kid tested and approved and entirely made in the USA. 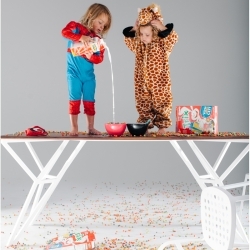 Trix not included. All black everything. 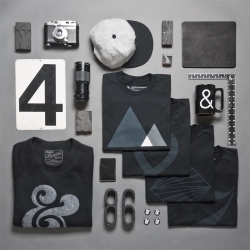 Sleek new Black Series from Ugmonk. 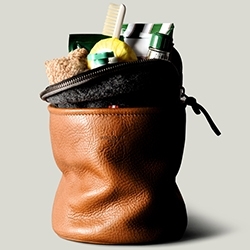 Hard Graft goes vertical for their Refresh Dopp Kit made of "über premium vegetable tanned Italian leather"
VIDEOTEAGUE X Sizemore's DENNY bike is the “all in” cycling solution that meets security, safety and importantly convenience needs. 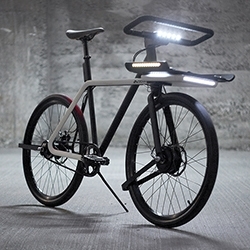 DENNY was born from a simple premise, ‘an everyday bike that removes the barriers to becoming an everyday rider’. 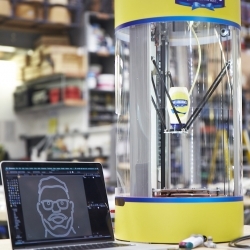 VIDEOBurger Selfies: Hellmann's prints mayo faces onto burgers by hacking a 3D printer. 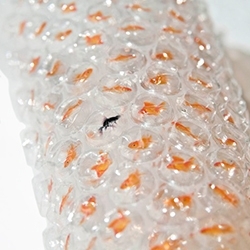 Goldfish bubble wrap, from Kaboomi Studio. 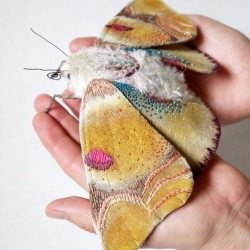 Colorful moths and butterflies by North Carolina based artist Yumi Okita. 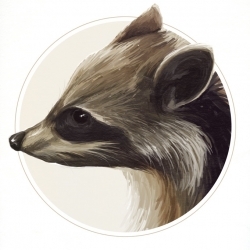 The pieces are made by hand using fabric, cotton, fake fur, fabric paint, embroidery thread, wire, and feathers. 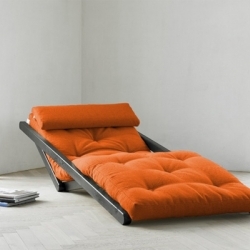 Figo Futon Chaise Lounge converts easily from chaise lounge chair to a low bed. 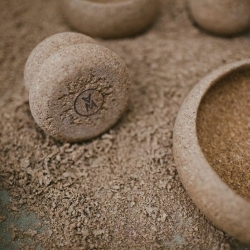 Cork 101 - how cork is made, the benefits of cork, and line of cork goods by designer Melanie Abrantes. 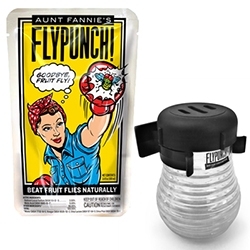 Aunt Fannie’s FlyPunch! is scientifically engineered to attract and kill fruit flies. Sure you could also use wine/vinegar/etc - but the fun branding and simplicity of instructions is quite nice. London-based street artist, SHOK-1 known for his ‘X-ray‘ murals, completed ‘The Consumer‘ in Hamburg, Germany. 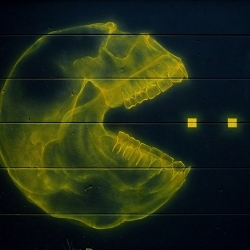 Shaped like the iconic game character Pac-Man, the artist’s clever take on our own modern day vices catches passerbys attention. El Trio by Sebastian Lara + Roberto Sedano. 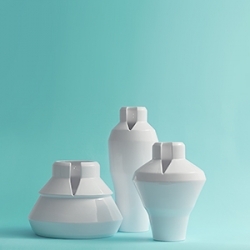 This series of vases made of glazed ceramic, are inspired by traditional Mexican music trio. 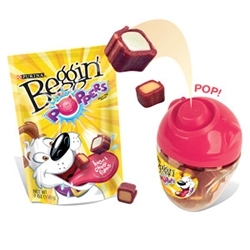 Beggin' Party Poppers Dog Treats - adorably smart packaging - pop a treat on the pigs nose, press it in, and out it pops! 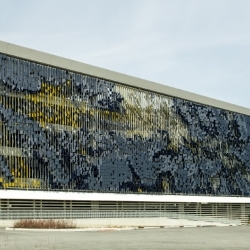 An interactive facade fronting a parking structure at the new Eskenazi Hospital in Indianapolis, Indiana. A field of 7,000 angled metal panels in conjunction with an articulated east/west color strategy creates a dynamic façade system. 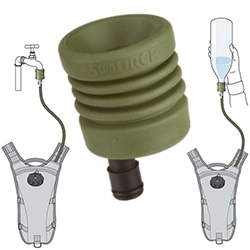 Source Outdoor Universal Tube Adapter - A smart setup to refill your hydration packs from the tap or a waterbottle without having to open your pack! 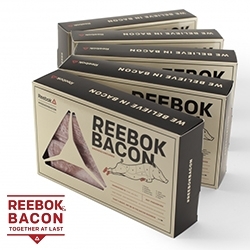 And apparently it even fits with Camelbak systems says someone on Amazon. 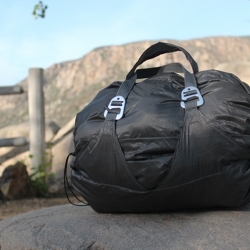 Hoboroll, stuff sack with internal compartments to help keep items separate and organized, and compression straps to save space. Two tabs on each side convert Hoboroll into a shoulder bag or backpack. 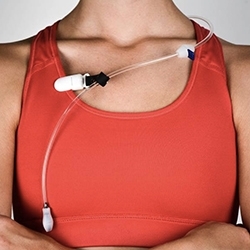 Hydration Bladders shifting to tiny tubes? GearJunkie takes a look at the Geigerrig mini hoses coming in the fall. 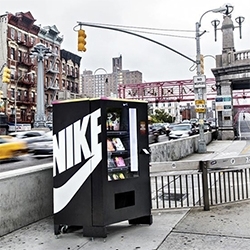 Nike FuelBox Vending Machine has popped up in NYC - and you can buy goods with your fuel points from the current day! 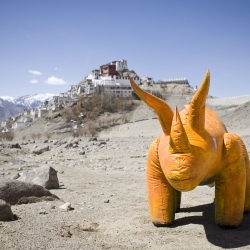 An unusual travel buddy in Nick Robles' new photo series Technicolor Dino. The Swings: An Exercise in Musical Cooperation from Daily Tous Les Jours inspired by their previous work 21 Balançoires. 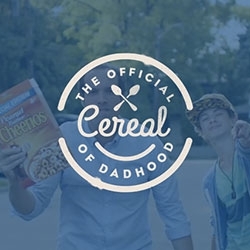 Tribal Worldwide Toronto brands Peanut Butter Cheerios as the Official Cereal of Dadhood. Beautiful beast, an unusual spider-like accessory from Martín Azúa that creates temporary piercings while worn. 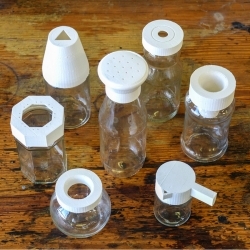 Troppi Tappi is a small set of 3D printable jar caps to modify and reuse glass jars. 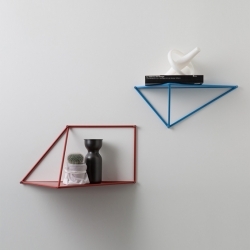 The collection has been designed by italian lab PiuLAB. You can download all the 3D models. 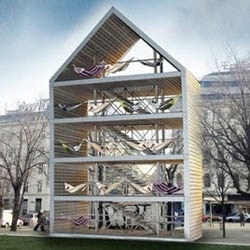 Flederhaus in Vienna is part public art, part public meeting space with 28 hammocks, designed by Heri & Salli Architects. 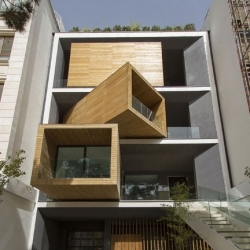 Interesting Sharifi-Ha house in Tehran by nextoffice with semi-mobile rooms to create extra space and light. 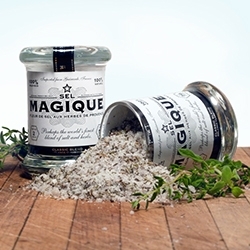 Sel Magique - beautiful branding and packaging for this line of gourmet fleur de sel herbs de provence. 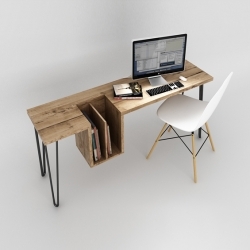 'One-High Table' by canadian designer Endri Hoxha for EhoEho. 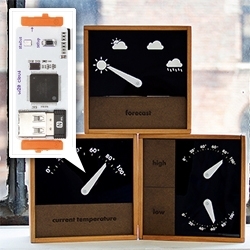 LittleBits cloudBit! The latest component lets you create internet­-connected devices! Everything from weather dashboards and SMS-doorbell alerts to garage openers and whatever you can dream up. 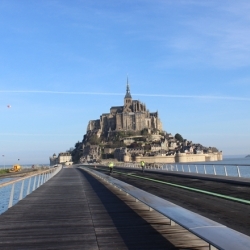 Dietmar Feichtinger Architectes unveiled a new 760-metre long bridge connecting the Normandy coastline to the medieval town of Mont Saint-Michel. Christian Louboutin Rouge Nail Lacquer. A true objet d’art of a dramatic 8-inch height inspired by the tallest heel Christian Louboutin ever created- the Ballerina Ultima. 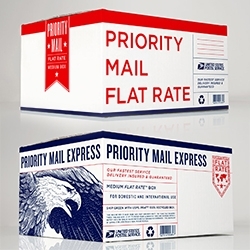 It is packaged in a weighted ombré glass bottle with a special triangular brush. 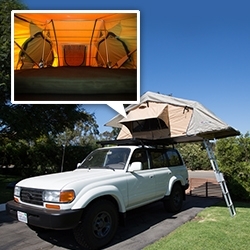 FEATUREDNOTFZJ80 Project: our ARB Simpson III Roof Top Tent. 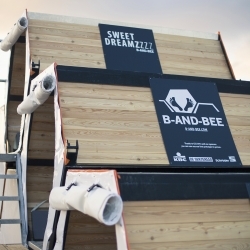 Cantilevering off our roof rack, you climb up the aluminum ladder to a nearly queen sized foam mattress and fun views. I'm still amazed it sets up in minutes. 'Shelves' by designer Max Lipsey for Cappellini. 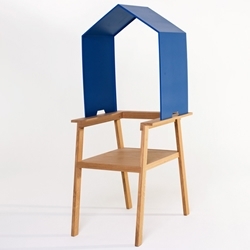 Armchair that becomes a personal space by adding a roof, by Dutch designer Bram Burger.